PUMA Women’s Creative Director and Brand Ambassador, Rihanna, and Global Sports Brand PUMA kick off their first venture with the release of the PUMA BY RIHANNA Collection under Rihanna’s FENTY label. 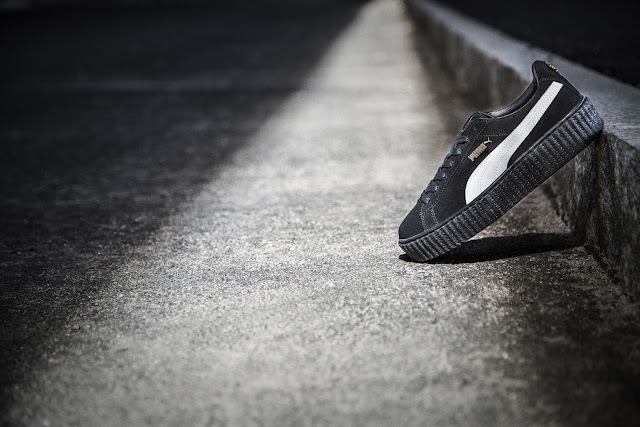 Under her creative direction, the first collection introduces the PUMA Creeper, remixing the iconic PUMA Suede with a little bit punk and a little bit rebel. Exclusively in New York from Today (September 15th - 17th), PUMA will host a pop-up store at 312 Bowery Street between East 1st Street & Bleecker Streets in Soho. This will be the only brick and mortar store worldwide where consumers can purchase the black-white colorway early, as well the other two Creepers colors from the September drop. The PUMA pop-up store will be open from 12 pm - 5 pm on Tuesday, September 15 and 11 am – 7 pm on Wednesday, September 16 and Thursday, September 17. Limited pairs available for sale during the pop-up and purchases are limited to one pair per person.